Me? You want to know about me? I dunno. What do you want me to tell you? Well, I’m Takuhiro. I’m from Kajicho. It’s in Kanda. Do you know Kanda? They have a famous festival there every year. It’s very traditional. But I guess my area is all office blocks now. There isn’t much to see. I’ve lived in the same house all my life. I’m nearly 50 now. Can you believe that!? My wife and I live with with my father and I help him with his business. I’ve been part of the Lebels gang for about five years now. We like Rockabilly music, old rock n roll. Our rival gang is The Strangers. Every Sunday we set up at the edge of Yoyogi Park and dance. We don’t fight or anything. Rockabilly isn’t about that. But we don’t talk to the other gang either. I don’t know, it’s just always been like that. They do their thing and we do ours. We don’t fight or anything, but I wouldn’t say we like each other. I guess we respect each other. Do you understand? Anyway, I’ve danced with The Lebels for a long time now. They are like a family to me. And I still have the same pair of shoes since I started. Look at them! People ask me why I don’t buy a new pair of shoes. 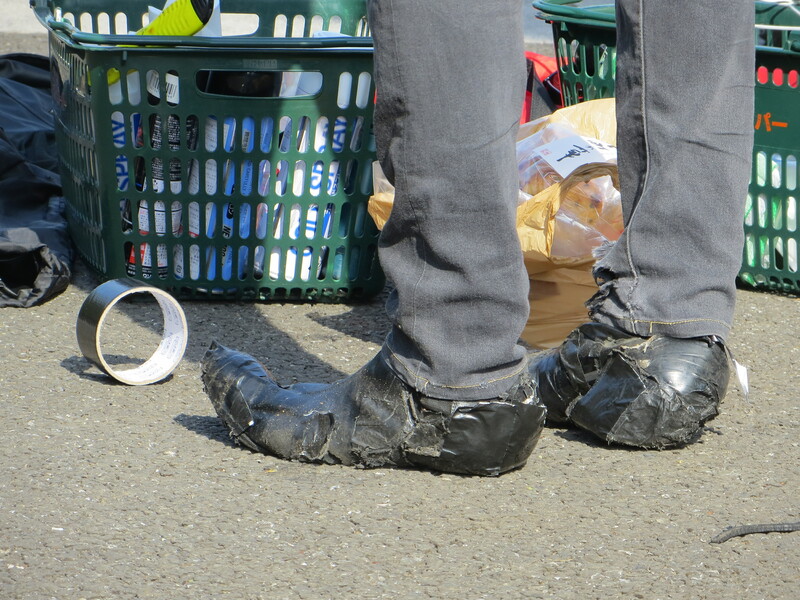 “Takuhiro, you have more tape on your shoes than leather!” they tell me. They find it funny. But I’m worried if I get new shoes something might change, you know? Because I’ve had these shoes since I started. Maybe if I get new shoes I won’t be the same Takuhiro anymore. Do you understand? Good for you Takuhiro! Keep on dancing and, by the way, Rockabilly is great music. Go on Takuhiro my son! Pingback: Ikimasho! 2013 | Ikimasho! Pingback: Ikimasho! on the BBC | Ikimasho! Pingback: IKIMASHO! x DAZED: What the hell has happened to Tokyo’s fashion subcultures? | Ikimasho!